Pee 'N' See is a home pregnancy test. 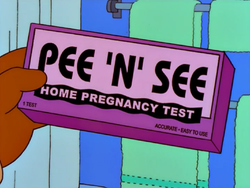 When Apu and Manjula were trying for a baby, they used the Pee 'N' See home pregnancy test. Their second test came up positive. The pregnancy test works similar to a scratch card. Three icons show up on the test. If you get three babies, you are pregnant. The first test Apu and Manjula did came up with two babies and a lemon, meaning Manjula wasn't pregnant. The second test came up with two babies and a pirate. Since the pirate is a wild card, Manjula was pregnant. Modified on August 15, 2018, at 08:40.